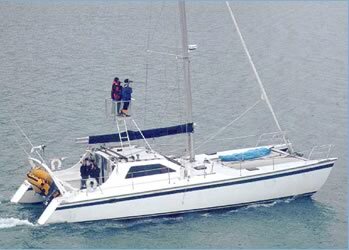 Catalyst, a 15.3m Ron Given sailing catamaran, was bought by Dr Steve Dawson and Dr Liz Slooten, as a platform for their research on Hector’s dolphin. Hector’s dolphins, the world’s smallest dolphins, are found only in New Zealand, and are classified as Endangered due to entanglement in gillnets set by commercial and recreational fishers. In 1996, the most urgent need was for updated information on the dolphins’ distribution and abundance. In the best dolphin surveys, observers are stationed on an elevated platform from which they make observations with special binoculars. The binoculars allow measurement of the range to each dolphin sighting - these data are used to calculate dolphin density, and abundance. Survey speed must be reasonably fast (usually 10 knots), to minimise the chance of counting the same dolphins twice. For these reasons, high-quality dolphin surveys are done from relatively large ships. Drs Slooten and Dawson, both keen sailors, knew that catamarans can provide the stability and speed of a much larger monohull, at a fraction of the purchase and running cost. They approached several catamaran designers, and with Ron Given’s help found a suitable vessel second hand. They fitted a collapsible sighting platform, which folds easily to allow sailing. Larger 50hp Yanmar saildrives with 3 bladed feathering props allow a 10 knot cruising speed. More fuel capacity, a “radar arch” to lift a 4m inflatable tender, better electronics, a diesel heater (needed in southern latitudes! ), an extra berth and standard offshore safety gear completed the makeover. Catalyst has been a very successful research vessel, covering roughly 25,000 miles in four summers of intensive “line-transect” surveys of most of the South Island west coast. These surveys have provided fine-grained data on the Hector’s dolphin distribution and abundance, showing that the total South Island population numbers about 7300 (CV = 16%). Without compromising data quality, the surveys have been completed for about a twentieth of the cost of comparable surveys on research ships. In addition to showing that high-quality surveys can be done at low cost, the surveys have set the scene for better management of human impacts on Hector’s dolphins. Many of the changes to Catalyst were made to boost her motoring performance and range. The combination of excellent performance under sail and motor makes her not just a valuable research tool, but fun to sail as well. Under sail she has exceeded 20 knots dozens of times. Best speed so far is 22 knots broad-reaching in 28 knots of wind, with only one person on watch. The rest of the crew were below sleeping or reading, blithely unaware that Catalyst was going so fast!